Palo Alto is a strong market which feels the ebbs and flows of the fickle real estate market less than both its more expensive and less expensive counterparts. Palo Alto should be considered a seller’s market with a rapid turnover of its inventory with DOM averaging between 10-20 days for the last four months, and not over 50 days since March 2011. The median price has been on a steady increase for the better part of the last year, and the sales absorption rate has been following the same trend. Historically, Palo Alto has been a very desirable place to live and will continue to be one of the most consistent investments in all of the Bay Area for the foreseeable future. All the market data should continue its upward trend and only time will tell how high it will go. The MSI and DOM for Palo Alto are shown on the chart above. The DOM has seen a mostly downward trend since May 2010 without large cyclical changes. 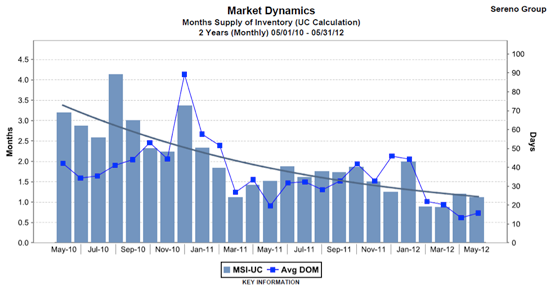 For the most part, the level of inventory has been decreasing since May 2010 with a slight uptick in the last couple of months. Inventory supply is currently sitting at just over one month. 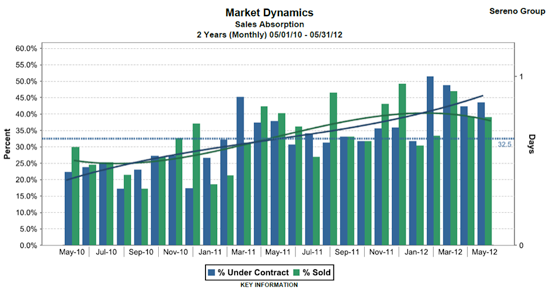 From May 2010 to May 2012, the sales absorption rate has been steadily increasing. In May 2012, the current sales absorption rate was 43.5% of properties under contract and 39.0% of properties sold. Palo Alto’s median price only dipped slightly in late 2010/early 2011, then saw an early start to its upswing in July 2011 as opposed to the September 2011 upswing start in the Mountain View, Los Altos, and Los Altos Hills. As far as price, Palo Alto’s continuing median price increase is the most consistent of Mountain View, Los Altos, and Los Altos Hills ending in May 2012 at $1,654,500. There are several key statistics that are used to determine the health of any real estate market – average days on market, month’s supply of inventory, sales absorption rate, and the median sales price. Days on market (DOM) describes how long a home is active on the market before its status changes to pending. The average days on market is determined by adding each listing’s days on market in a month, then dividing by the number of active listings for sale at the end of that month. Palo Alto, the feather in the cap of Silicon Valley real estate, struggled with its median sales price, falling two straight quarters after reaching its peak in second quarter of this year since the housing bust. The fourth quarter of 2010 was lower than the same period in 2008 ($1,350,000) and in 2009 ($1,370,000). This is due to two factors: the real estate market adjusting to pre-bubble prices, and fewer expensive properties being listed because of the deprecated values. On the positive side, sales are up overall, beating all previous quarters this year and the fourth quarters of 2008 and 2009. The sales price to list price ratio is also one of the most balanced of our four city comparison, and with a ratio just above 100%, the only one favoring the seller. Palo Alto really established itself this quarter as a market leader. Compared to the third quarter in 2009, Palo Alto has improved in all five measures. This quarter Palo Alto jumped its selling price to listing price ratio ahead of the other three cities in our comparison to 101.26%, turning it into a seller's market. Though, what this means for future home prices or the market is anybody's guess as we enter the winter quarter. The average days on market in Palo Alto remains the lowest of our four cities at 35 days, a drop from 57 days for the same period last year. Palo Alto also has the highest total sales volume, even though it has the second smallest population in our comparison. This is due to the wide range of property values available in Palo Alto, from just under a million to the many millions. Because Palo Alto has a wide range of home prices, the entry-level market remained strong as buyers looked for bargains and the high-end market slowly recovered through the second quarter of 2010. The median sales price in Palo Alto is 5.3% lower than the same period in 2008, at $1,468,000. A huge jump of 82.2% from last quarter and just 5.5% lower than in 2008 was realized in total sales volume, at $205,188,388. Average days on market is just over a month and there were 123 sales this past quarter, similar to 2008. Palo Alto holds its title as a premier housing market with the highest total sales volume of our four comparison cities, and will continue to become increasingly difficult for buyers to enter the market as the sales price to list price ratio continues its rise to 100%. The properties are listed as detached and attached single-family homes, which are unlike the the condominiums and townhouses available at the previous housing developments we have reviewed, Altaire and Sterling Park. Redwood Gate may have better features, a better location and more square feet than its "competitors," but it also has a higher price tag -- $1.15 million to $1.499 million. Continue reading to find out more about this Silicon Valley real estate development and see if it lives up to the old adage: you get what you pay for. Redwood Gate is one of the smaller real estate developments in Palo Alto with just 35 detached and 10 attached single-family homes, plus a half-acre park. Construction of the single-family homes at Redwood Gate started in 2009 and will be completed by the first quarter of 2011. The neighboring Elks Lodge is also under construction and will be completed by October 2011. As of June 2010, 26 homes have sold and nine homes are currently available; in the future, the five homes in the park location, two of the attached homes and the three remaining model homes will be available. The development is located in the Charleston Meadows neighborhood and close to the neighborhood’s three schools -- Juana Briones Elementary, Terman Middle School and Gunn High School -- that are all less than a mile away, and off of Arastradero road. As a further incentive to visit Redwood Gate, receive a $50 Visa gift card for scheduling a tour of the properties with one of our agents in the month of July. Redwood Gate properties are listed on MLS Listings Inc. as either attached or detached single-family homes, but sold to homebuyers under condo ownership and approved for loans under the detached condo category. This is the only way that developers could get approval in Palo Alto for building homes that have a large living space on a small lot. Otherwise, the residences resemble the single-family homes they are priced at -- the median price for homes in Charleston Meadows in 2009 was $1.25 million; condos were $801,000. Being in a single-family home, instead of the condos and townhouses found at Altaire and Sterling Park, means that the homes do not share walls (even the duet-style homes, which are connected but have air space between walls), and the homeowner owns the house along with the land underneath and the yard for 10 feet. Homeowners, also, own a percentage of the common area through a $202 monthly HOA fee, which includes landscaping, all water usage, garbage collection, exterior property insurance. Along with a difference on paper between Sterling and Altaire, is the difference when you see the property. Redwood Gate properties are about $500,000 more than a comparable townhouse at Altaire, but also have a two-car garage, large patio space, high ceilings, an extra loft room and 500 square feet more. All seven floor plan options are still available at Redwood Gate as of June 2010. Plans range from three bedrooms two-and-a-half-baths and two stories through five bedrooms three-and-a-half-baths and three stories. Residence 1A has 1,7775 square feet all the way through residence 7B with 2,380 square feet, and listed at $1.15 million through $1.42 million, respectively. Upgradeable features are also an option. New and modern homes. We’ve already mentioned the extra space and privacy that Redwood Gate allows, which means there is more flexibility for growing families. A new build means modern features, including Kohler sinks and faucets, GE stainless steel appliances, maple cabinetry, granite countertops, volume ceilings. 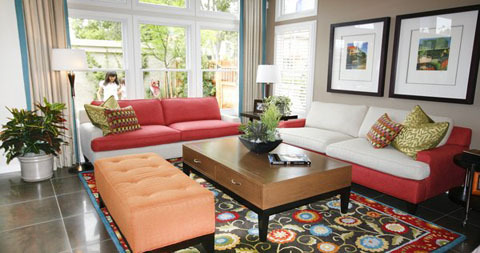 Homes are also designed to be GreenPoint Rated, which help in energy efficiency and are environmentally friendly. Smaller development size means a closer community and less hassle over parking spots, including the 14 guest spots. It is also surrounded by another housing development, the Elks lodge, and a pleasant residential area on Wilkie Way in the rear. Good location in Palo Alto. If you ignore the busy El Camino Real intersection, Redwood Gate is better and more centrally located in Palo Alto over Altaire and Sterling Park. It is walking distance both to schools and Robles and Briones Park, and one mile from Charleston Shopping Center and San Antonio Shopping Center. Strong home values. Because Redwood Gate properties sell as single-family homes their value will be more stable over the condo and townhouse market. In addition, Palo Alto, as we have seen, is one of the strongest real estate markets in Silicon Valley. Traffic on El Camino Real can be difficult, but noise shouldn’t be an issue because the Elks Lodge lies between Redwood Gate and the street. Limited parking could be a pain if you plan on having more than two cars. Besides the 2-car garages, there are only 14 guest spots available here. It is a high purchase price for condo ownership at Redwood Gate when considering that the median selling price in 2009 for homes in the Charleston Meadows neighborhood was $1.2 million. Having said that, the homes have been selling at a rate of two a month, so demand is clearly there. Another consideration is that standard homes under $1.2 million in Palo Alto are not going to be new and most likely need repairs or upgrades, and lack the premium build and features that a new development like Redwood Gate has. Altaire and Sterling Park aren’t comparable since price and features differ so much as we covered under the pricing details category. The locations of these properties are less than ideal since both sit near 101 and at the edges of Palo Alto. Another option for homebuyers in this price range would be to consider an entry-level home. In the past three months (April, May, June 2010), the median price in south Palo Alto for single-family homes has been $1.26 million. Of those homes that have sold, the average age is 56 years old, average interior square footage is 1,779 and average lot size is 7,200 square feet. So Redwood Gate homes have equivalent interior space and come with all the advantages of a new build and low maintenance, but on the other hand, lack in lot size and ability to customize when compared to a traditional home in Palo Alto. These homes are generally targeted for people that are moving up from a condo or townhouse and need the extra space for a growing family. The residences offer the benefits of a new community development but also the future stability in home values that a single-family home has in Palo Alto. Of course, Redwood Gate prices reflect these criteria and it certainly is a quality development, but the high-price tag could be a determining factor for a lot of potential homebuyers. Feel free to contact us for more specific information and an opportunity to tour Redwood Gate in-person (plus a $50 Visa card if you visit in July), or just to find out more about our unique Silicon Valley real estate services. 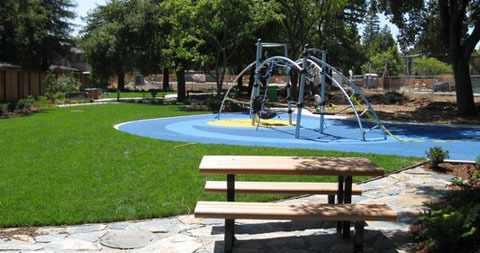 Sterling Park is another of the recent housing developments in Palo Alto, which also includes Altaire and Redwood Gate. Located in the Midtown neighborhood, the use of mixed housing and two on-site parks helps Sterling avoid the compact feeling of standard developments in Silicon Valley and lets its residents enjoy some extra space. Click through to find out more about the property. Parallel to the 101 freeway and on the corner of West Bayshore Road and Loma Verde Avenue, 96 units compose the new Sterling Park development, which is slated to be completed early 2011. The development is broken down by 28 detached single-family homes, 39 townhouses and 29 condominiums. Potential buyers should be aware, however, that all its single-family homes are sold out, and only one remaining three-bedroom and two remaining two-bedroom townhouses are available as of June 2010. That leaves the 29 one-and three-bedroom condominiums left, which will be released for sale this October. The six and a half acre site accomplishes a neighborhood feel with wider streets, mixture of home types, focus on the two central parks, and a nose mitigation wall beside the 101 freeway to reduce the noise and view of passing traffic. The Midtown neighborhood, which Sterling is located in, is known for its small-town feel and there is a variety of positive things to say about the nearby schools -- Palo Verde Elementary, Jane Lathrop Stanford and Henry Gunn High School. For basic information, available floor plans, features and sales information about Sterling you can visit their web site. If you are ready to visit the property for your first time, consider representation from a local Silicon Valley real estate agent who can provide information about local comparable properties and help in sales negotiations. The second half of an older post I did goes over these considerations. The two remaining two-bedroom three-bathroom and one-car garage (floor plan 4) townhouses start just under $800,000. The last three-bedroom three-and-a-half bathroom and two-car garage (floor plan 5) townhouse is selling for under $900,000. The upcoming 29 condominiums will start at approximately $600,000 when released late 2010. They will have either one or three levels, with a respective amount of bedrooms; and range from 1,050 square feet to 1,800 square feet. In addition, all properties include either a one-or two-car garage. Street parking will be limited to the 39 visitor parking spots and reserved spots that are estimated to sell for $5,000 each. Homeowner’s association fees will initially be $325 a month, but reduced to under $200 once all the homes sell out, which should occur upon the developments completion by mid 2011. Lots of space. Because Sterling is composed of single-family homes, townhouses and condominiums, two parks and a community recreation center, the scenery is more pleasant than the dense row housing we usually see in developments. Traffic shouldn’t be a problem on West Bayshore Road and most parking inconveniences have been reduced since every property has their own garage. Affordable, luxurious, green. Prices starting at $600,000 for a condominium in Palo Alto are a strong draw for many first-time buyers. But Sterling also has luxury features such as gourmet kitchens with General Electric appliances and granite countertops, and large master suites. Standard green and energy-efficient features reduce utility bills and result in quieter homes. A location in the Midtown neighborhood means Sterling is only one mile away from fulfilling basic shopping and restaurants needs at the Midtown shopping center, which includes Longs Drugs, Safeway, Starbucks and Mike’s Cafe. And only half a mile from Greer Park, Seale Park and the Palo Verde Elementary School. Beside two office buildings and the noisy 101 freeway. The developers did their best to mitigate both these issues by, first, focusing the real estate development inward and towards the parks. Second, noise levels have been reduced by a wall built along the freeway. Lastly, for condos located on Bayshore Road, the developers have taken extra measures to reduce the noise through sound insulation like double-pane windows. Two other currently competing real estate developments in Palo Alto are Altaire and Redwood Gate. Comparable properties at Altaire are about $100,000 higher and Redwood Gate is mostly detached homes starting above a million. So expect nicer overall building quality and features at those two developments, but both are located at crowded intersections. Redwood Gate has the advantage of being centrally located in Palo Alto, while nearby Altaire is at the boarder of Palo Alto and Mountain View. Most buyers looking into Palo Alto already know about its strong real estate market and fantastic school district and API scores. But most are taken aback by the steep Silicon Valley real estate prices, and is why many developments in Palo Alto make it possible for new homebuyers to break into Palo Alto’s prestigious market. Sterling Park reflects this demand and doesn’t skip on features that should enable the properties to hold their value in the coming years. Feel free to contact us for more specific information and an opportunity to tour Sterling Park in-person, or just to find out more about our unique Silicon Valley real estate services. Altaire, the newest townhouse development in Palo Alto, should be on anybody's shortlist when looking for an entry-level opportunity to move into the area without forgoing quality accommodations. We'll cover some important details you should know about the property in this post. The 103 urban-looking townhouses are set along open walkways and adjoined to the recently constructed Taube-Koret Campus for Jewish Life, which, together, create a feeling that is unique from traditional high-density developments. The whole complex site is right off the 101 freeway at 3901 Fabian Way. Construction on Altaire is expected to be completed by late 2010. As of June, 59 of the 61 townhouses already completed have sold, and developers are currently in the last phase of construction for the remaining 42 homes, which are expected to be sold out by the end of the year. For a quick description of Altaire, floor plans and features visit their website. You can also take a YouTube tour of the residences and view example show homes on their flickr page. Also of note, when considering a property, especially a new build, representation from a real estate agent can help provide the buyer with a larger knowledge base in areas like negotiating a final sales price or showing comparable properties in the area. The second half of an older post I did goes over these considerations. Available properties include one, two, three and four bedrooms; and prices start at $479,000, high-$600,000s, $739,000 and high-$800,000s, respectively. The typical three bedroom unit is around 1,300 square feet, while a four bedroom is around 1,900 square feet. Homeowner's association fees are from $375 to $475 a month and include: water, disposal, landscaping, insurance, two underground parking spaces and storage, and maintenance. Also included in the purchase price is a free year membership to the JCC fitness center — a 33,560-square- foot space that includes an indoor and outdoor pool, basketball court and gym, and an expected membership of 10,000. The campus also has a preschool, senior living residences, and cultural arts center. Altaire is an upscale townhouse community. New owners can expect spacious and contemporary designs, stainless steel Bosch appliances, in-home laundry, high-efficiency air and cooling, secure underground parking, and high-speed Internet connections. The townhouses were designed to meet both ENERGY STAR and GreenPoint Rated programs for energy efficiency and eco-friendliness. Being located in Palo Alto means residents can expect some of the best schools (Fairmeadow Elementary, Jane Lathrop Stanford Middle School and Gunn High School) in California, a bustling downtown, Stanford University and Shopping Center, and a strong local government. 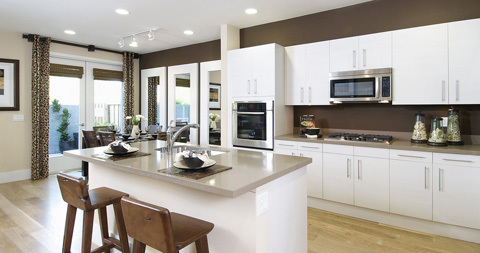 Altaire is ideally located near the Baylands Preserve, Shoreline Amphitheatre, Century 16 Theatres, and retail developments Charleston Plaza and Rengstorff Center, which includes Costco, Best Buy, and REI. 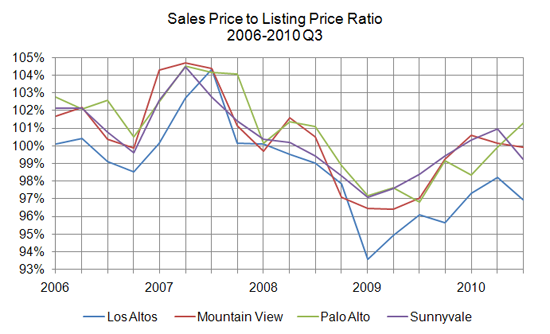 Strong home values will continue in Palo Alto as we have seen in the 2010 quarterly post on the real estate market. The adjoined Community Center creates a convenient neighborhood environment. Just outside the door is the previously mentioned fitness center that also has a soccer field, tennis courts, and Pilates and yoga studios. There is also a cultural arts center, cafe, preschool and day care, meeting rooms with planned adult programs and lectures, and senior living residences. Area originally zoned for commercial buildings. Altaire and the community center was built atop the old Hewlett Packard site, which means that the surrounding scenery is mostly corporations like Space Systems/Loral on Fabian Way and the 101 freeway nearby. Being at the edge of Palo Alto means a longer drive to downtown, schools or other popular spots in the city. Conversely, though, it is located near two big shopping centers, the movie theater and concert venue, and Baylands Preserve. Expect more traffic and noise from the busy intersection at San Antonio Road and East Charleston Road, and also when the Community Center holds events -- an expected trade-off of living in a more urban environment. Buyers also get two underground parking spaces with storage, but not the convenience of an attached garage. Sterling Park is another new housing development on 1080 Loma Verde Ave., which is a mile north of Altaire and separated from the 101 Freeway by West Bayshore Road. The development has sold out of single-family homes, but the remaining townhouses are priced and have a contemporary style similar to Altaire, though different floor plans and amenities available. Sterling Park has attached garages and is adjacent to a residential neighborhood and near Greer Park, but on the other hand, there are commercial buildings on two of its sides. Lastly, most of the remaining townhouses available sit on West Bayshore Road. As with any home purchase, there are positives and negatives that the buyer must personally weigh in their final decision. Palo Alto's strong real estate market and outstanding school district and API scores is a draw for many buyers, and combined with today's depreciated market increases the attraction. Additionally, Altaire makes the most of its location, offers premium townhouses and a Community Center that other developments cannot match. For these reasons, first-time buyers and anybody interested in a new build should take the time to consider if Altaire is the right place to settle down. Current Palo Alto real estate market update for 2010. Looks at median sales price, days on market, and the entry-level and high-end market in Palo Alto. The California Department of Education (CDE) has released the updated 2006 Academic Performance Index (API) scores for California schools, including data for San Mateo County and Santa Clara County. The API is a statewide benchmark based on standardized achievement tests which is primarily used to rank schools relative to one another and relative to schools with similar demographics. Here's an example of what the statistics look like. We'll take a look at how school rankings and Silicon Valley real estate prices are related, but first let's look at how to read the information. Number of Students. In the first column, you'll find the number of students whose results were included from that school. It's pretty close to the total number of students, less any excluded students. The rules for excluding students are listed in the API Base Documentation Information Guide found on the CDE API page. Surprisingly, the number of students has little to do with how well the school did in its API scores (almost, see epilogue). Base API, Statewide Rank, Similar Schools Rank. The Base API score is like an SAT score except it's from 200 to 1000. Higher is better. To make comparing schools easier, the CDE provides a statewide rank from 1 to 10 (ten is best) and a similar schools rank that rates schools (again from 1 to 10, ten being best) that have similar demographics and characteristics. Apples-to-apples in a way. Growth Target, API Target. The growth target is the number of points California wants the school to improve in the next year. That added with the current base API score equals the API target. The CDE doesn't set a target for schools above the current statewide performance target of 800. I've assembled information from the CDE site and the Palo Alto Daily News to provide a table of school district API averages for Silicon Valley and Bay Area elementary and middle schools. Remember the chart of median Silicon Valley single-family home prices in February 2007 from my article Determining Your Must-Haves When Buying a House? First, while Cupertino and Foster City housing prices are very similar, there is a vast difference between the performance index of their school districts. On school rankings, compared to Foster City, Cupertino represents a much better value based on the median sale price of single-family homes. Second, while Los Altos has the highest API scores, it also had a much higher median price putting it on-par with other elite school districts like Palo Alto and Los Gatos, but well-below Saratoga which had both higher test scores and a lower median home price. Third, it is possible to cherry-pick good schools in average school districts. For example, you can search around Sunnyvale's Cherry Chase Elementary, which has a base API score of 941, if you're looking for a good elementary school. Stay tuned. There's a quirk in the ratings system where only test scores for "statistically significant" groups (read: ethnicities) are counted. Some schools, none that I can find documentation on, were accused of reclassifying lesser performing students into groups that weren't statistically significant to prop up their overall test scores. There is a measure of transparency, though, because if you drill down on the individual schools, it will show which groups were counted, which weren't, and how many were in each.